Switch effortlessly from thick to thin and small to large slicing with this ingenious KitchenAid Food Processor – a robust and powerful machine that is essential to any kitchen. Switch effortlessly between thick and thin slices with the externally adjustable ExactSlice System. Featuring optimised speeds and an external lever, achieving consistent and precise slices has never been easier. By simply sliding a lever, you can take the hassle and mess out of food preparation. The KitchenAid Food Processor comes equipped with a magnificent 3-in-1 wide mouth feed tube, designed to accommodate large items such as tomatoes, cucumbers and potatoes. Such versatility is what makes the KitchenAid Food Processor the perfect addition to any kitchen. 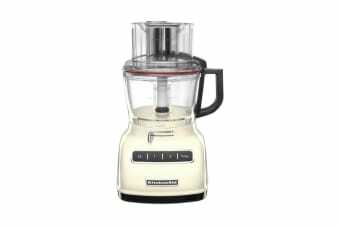 Take the mess out of food preparation with the KitchenAid Food Processor, which features an UltraTight Seal. This specially designed locking system features a leak-resistant ring, which allows you to maximise the capacity of your work bowl. Stress less about the mess!